I’ll never forget the first time I visited Cape Breton. 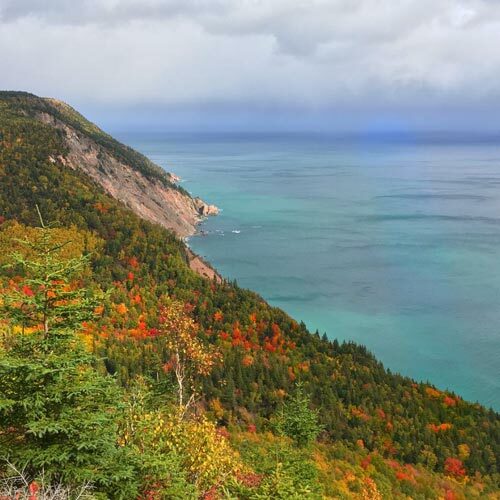 My grandmother, who is originally from Cheticamp, took me on a trip to experience the Cabot Trail when the foliage was at its peak in mid-October. I was overcome with emotion as each twist and turn in the road revealed walls of spectacular colour and coastal vistas. I was hooked—and I knew I had to share it with Brett. Every year since that first trip, Brett and I have returned to Cape Breton to soak it all up. 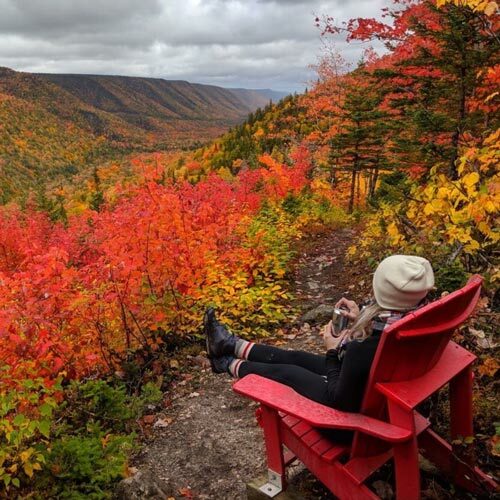 While autumn is unquestionably gorgeous, Cape Breton has so much to offer year-round. 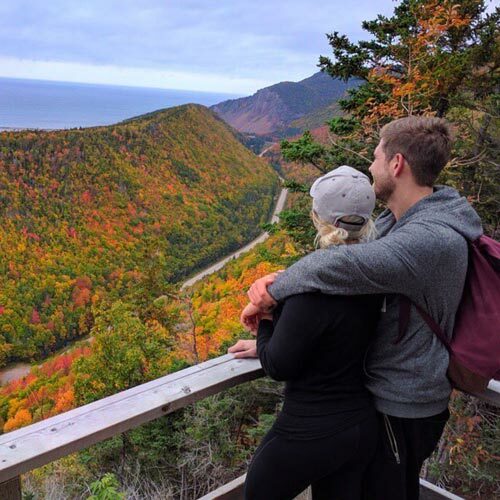 As a tribute to some of the incredible experiences we’ve had, I’ve rounded up some of Cape Breton’s most incredible look-offs, including the hiking trails and scenic drives that connect them. If you’re beginning to plan some warm weather adventures (or even far enough ahead to the fall—I really wouldn’t blame you! ), I hope these tips can serve as inspiration. Note: this post is the 2019 update from my original post in April 2018. I’ve discovered some wonderful new look offs and places to stay which deserved a place here! Learn more and get links for how to book each spot in my post, Best Places to Stay in Nova Scotia. One of my favourite hiking trails of all time, the Acadian Trail climbs 365 meters above Cheticamp, offering stunning panoramic look-offs along the way. The reward is well worth the work—taking in the views of the Cheticamp River, coast, and the rolling hills of the highlands is truly awe-inspiring. In addition to the incredible look-offs, you’ll notice the forest around you change as you ascend. The second half of the trail is a descent through the woods following a river. The full hike is about 12km and takes 3-4 hours; if you don’t have that time to commit, I recommend at least doing the first half of the trail which is where the look-offs are situated. Be on the watch for bears and moose on this trail! A short walk on a crusher dust ATV trail leads to what at one time was a gypsum quarry. The hole from the mine has since filled in with water, creating a gorgeous little lake with a vivid turquoise hue. The colour is reminiscent in some ways of the big lakes between mountains in Western Canada (just a LOT smaller!). When you arrive, to the left you’ll see a rope you can climb to get up to a look-off. While slightly vertigo-inducing, the view from the top of the steep hill is stunning. That said, use your own discretion; a misstep and a tumble could cause serious harm. If you’re visiting in the summer, this would be a great place to swim! The full walk to the Gypsum Mine and back can be done in under an hour as it’s only 3-4 km. No surprise here! The Skyline Trail is one of, if not the most, famous trails in Cape Breton. I’m not sure it qualifies as a hike per se—it’s more of a walk along a well-groomed crusher dust trail—but this makes it easier and more accessible, which can be a nice change of pace. The highlight of this trail is the incredible look-off at the end—it feels like you’re at the edge of the world! If you can plan it, this is likely one of the best places in all of Nova Scotia to watch the sunset. If you decide to take in sunset, make sure you give yourself enough time to get back before it gets totally dark, and/or come equipped with flashlights. There is lots of wildlife near this trail, so exercise caution; for example, I’ve seen moose just about every time I’ve been, and there is coyote in the area. We always carry a bit of coyote spray just in case. On the opposite side of the island from all of the places listed above, Franey Trail is also among my favourite hiking trails of all time. 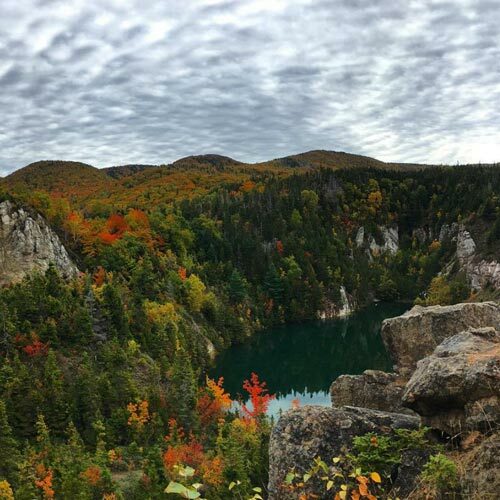 It shares some similar characteristics as the Acadian Trail in that it is a challenging uphill hike that rewards you with mind-blowing look-offs and views. The views from Franey, though, are altogether different and equally spectacular. The first look-off overlooks a river valley between highlands. The “main event” look-off is at the top of the trail and offers a 360 degree view of the coast which is attached to another river valley between highlands. Absolutely breathtaking! The trail is a loop and is about 7km; however, both times I’ve been we’ve simply gone back the way we came to enjoy the look-offs again on the way out. This cuts total walking time down by a bit and depending on your pace, you could do this hike in 2-3 hours. This is a well-established trail which features a gradual climb up the Aspy fault. The final destination is a breathtaking look off with views down the Aspy Valley. There’s even one of the Parks Canada red Adirondacks where you can sit back and enjoy the view! To the end of the trail and back is about 9km total. This trail has fantastic bang for your buck: Beulach Ban waterfall is accessible from the same parking lot as the Aspy trailhead, so you’ll get to enjoy a beautiful waterfall before heading up to the look off. More about Cape Breton’s waterfalls here. Cape Smokey Provincial Park has a number of wonderful look offs to enjoy. A few metres away from the parking lot are little footpaths which you can follow to look out along the coast, providing beautiful vistas without much effort. If you’re looking for a longer hike, follow the Cape Smokey trail (you’ll see signs). It’s over 10km total, so you can “choose your own adventure” in terms of how long you’d like to go. Early on in the hike is a spectacular look off (pictured above), and toward the end of the hike is a look off to Middle Head. Honestly, just driving from place to place along the Cabot Trail is an adventure in and of itself. I recommend taking the time to drive the full loop and enjoy the twists, turns, and delights around every corner. There are many look-offs along the way—you won’t be disappointed by stopping at just about every one of them to take in the scenery. To make the most of your driving, make sure you have a full tank of gas (there aren’t many if any gas stations in the deeper parts of the park) and put a fire playlist together in advance so you have great soundtrack to complement your visual experience! Are you planning a trip to Cape Breton? If you’ve been, what are your favourite look offs? Let me know in the comments!